Wearing the amount of makeup that I do on a daily basis can be quite a hassle when it comes to bed time and taking it all off. I love sitting at my makeup table in the morning and carefully applying each product to my face, ensuring that my eyeshadow is perfectly blended and that my lashes are coated to perfection so that my mascara isn’t going to budge throughout the day, but by the time the end of the day comes and I need it all to melt away sometimes it can be more of a pain in the arse than it’s worth. Sometimes I wish I was the kind of girl who didn’t care and I could just leave it on throughout the night, but then I become horrified with myself for even dare to think like that and trudge into the bathroom to tackle it with many a different type of skincare. I’ve tried many different types of lotions and potions to try and cut down the time I spend in the bathroom each evening and have never completely gotten my night time routine ‘down to a T’ so when I received a very cute package from Beauty Expert full of Aurelia ProBiotic Skincare to try out, I was over the moon! 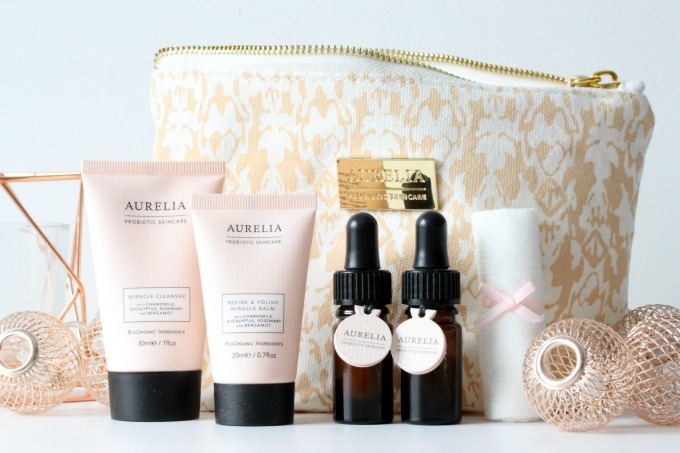 I’ve heard of Aurelia ProBiotic Skincare before, but had never tried any of it out so to be very kindly sent over a gorgeous wash bag full of mini’s to try out was perfect! Within the set was a mini version of the Miracle Cleanser, Refine and Polish Cleansing Balm, Revitalise and Glow Serum and a Cell Repair Night Oil and it was all perfectly sized for me to take away with me to Florida! The Miracle Cleanser is the first product that I tired on my full face of slap and I have to say that I was incredibly impressed with how easy it was to remove my makeup. Wanting to give it a full shot at wow-ing me I skipped my Micellar water to remove my eye makeup and massaged the cleanser all over my face, focusing a tiny bit more on my stubborn mascara. My makeup literally melted away and with one or two swipes with the muslin cloth (that I’d also received) my face was clear of all traces of the day’s hard work and looked fresh and far more radiant than most of my other cleansers ever leave me looking. After cleansing I use some of the Refine and Polish Cleansing Balm to give my face a tiny bit more of a scrub and then I applied the Cell Renewal Night serum all over my face in a thin layer before bed. 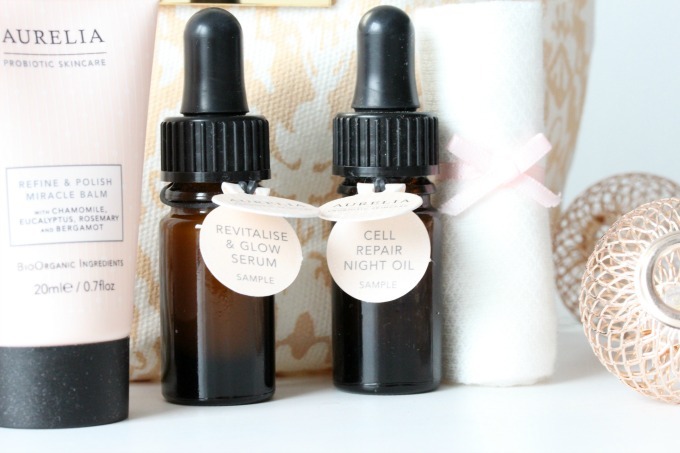 If you’ve read my Updated Skincare Routine, you’ll know that I am all over night serums (or I was until mine smashed) so to have a Night Serum to try out from Aurelia is perfect. The combination of both in the evening have left my skin feeling so much healthier by the time the morning comes around. In the morning I then cleanse with the Miracle Cleanser again and then apply the Revitalise and Glow Serum to give my self a bit more of an ‘awake’ look. It leaves my skin looking radiant and I feel so much better once this has had time to sink into my skin before I apply my makeup. Aurelia ProBiotic Skincare is made with BiOrganic plant and flower essences and is rich in precious omega oils to revitalise the skin. 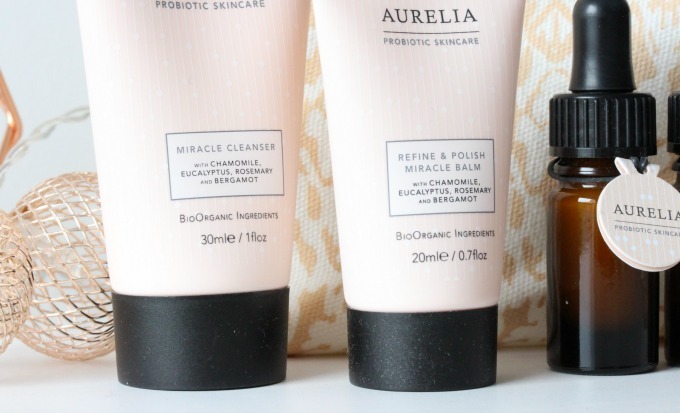 They’re not the cheapest of all products, but I think that for the quality of the products, how they have left my skin feeling and the fact that Aurelia ProBiotic is an independent British brand, the price is right on point and now with them being available on Beauty Expert, you can get all of your favourites in one place! Let me know in the comments whether you’ve tried any of these products before or whether you’re thinking of giving them a go! I’d love to know your thoughts.